This guide offers tips & tricks to understand public transport in Germany. Get tips to find cheap long distance train tickets, the best deals for regional trains, buses and trams. Train travel in Germany is convenient and efficient. Train stations are usually centrally located in most cities and towns. A taxi, U-Bahn, S-Bahn or bus can bring you to your final destination. I always thought it was pretty easy to travel by public transport in Germany, that's probably because I have done it all my life. However, when I read all your questions, I realise that it can be a challenge for visitors from abroad to find the best train ticket (Fahrkarte) or rail pass, and understand which trains they can use with their tickets. Most of the confusion results from the fact that there are two systems, the long-distance trains (Fernverkehr) and local trains (Nahverkehr). The latter also includes S-Bahnen, trams and buses. Read on, I am going to explain the difference as best as I can on this page. This will help you that you always use the correct tickets. To make things more complicated, the two systems often overlap when you travel "middle distances" within the same state, so it can be slightly difficult to get the right tickets. The cheapest tickets, that is. 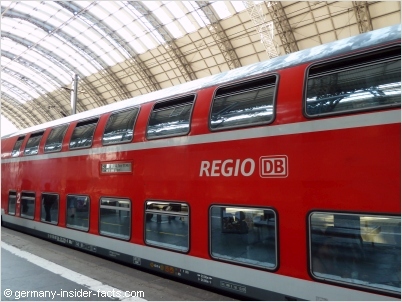 When you search at the DB website for connections from Frankfurt to Fulda, you can travel with an ICE train (31 €), or an IC (25 €). If you are lucky, you even get a safer fare (Sparpreis) for 19 €. However, you get the cheapest ticket when you use a regional express (RE) which will cost 15.25 € (Tariffs valid from December 2015). You can't purchase RE ticket online because it is a RMV local transport ticket. You can get it from ticket machines at the train station. Of course, you cannot travel with this inexpensive ticket on an ICE / IC train. However, you can use the expensive ICE ticket on a regional train. These trains are always operated by the Deutsche Bahn (DB) and include ICE / IC / CityNightLine trains. Ticket prices depend on the train type you use. If you travel one section of your journey with an ICE train, your ticket will be more expensive. 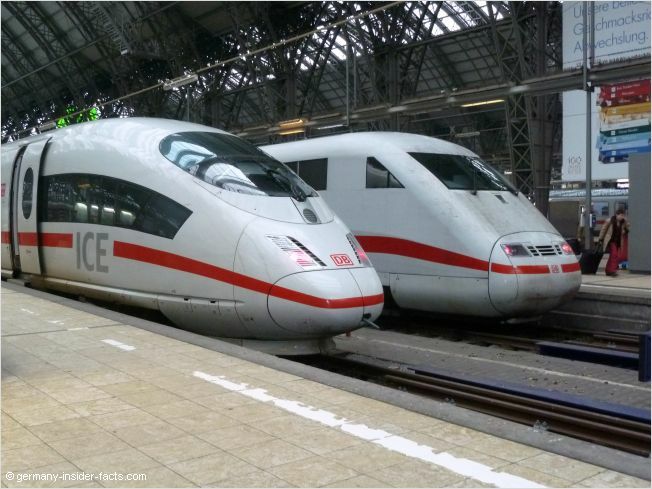 ICE trains are the fastest trains, but also the most expensive to travel with. They are fairly convenient and connect major cities in Germany on a frequent schedule. IC / EC trains are the slightly cheaper fast train connections between major city centres. Regional Express Trains (RE) are the most economical way to travel. Depending on the route you probably have to change trains more often, and it takes longer to reach your destination. For people who love train travel this is the way to go. Prices for long-distance trains vary in both the savings fare (Sparpreis) and standard fare (Normalpreis) categories. Fares depend on the route, the train type, demand for a certain train and perhaps other facts. Standard fares are much more flexible. Decide today where you want to go, buy the ticket online, or at a ticket machine, and off you go. However, it can be rather expensive, especially for trips over several hundreds of kilometre. There a different savings fare tariffs, some are only valid for travelling on weekends or return journeys. All savings fare tickets are only valid on the train booked, regardless if you bought additional seat reservation, or not. Tickets must be purchased at least three days before you travel. However, on many routes you need to book much earlier to get the best price. Travelling with children: Kids up to the age of 5 always travel for free on German trains. Register them when you buy your ticket if you want a seat reservation for the youngsters as well. Children from the age of 6 to 14 travel free if they are accompanied by their parents or grandparents. You need to register them when you buy your train ticket. Your own children also travel free when you use a Sparpreis, but you have to include them on the ticket. Kids in the age group 6 to 14 years get a 50 % reduction when they travel alone or with adult friends. Seat reservation is not included in a train ticket, you always have to pay for seat reservation separately. Although reservation is not required on most ICE trains, I really recommend seat reservation, as the long distance trains can be very crowded. You can book your seats online or at the train station. If you have a rail pass, be careful that you only purchase the reservation ticket. As a pass holder you never need to buy train tickets, the pass is your ticket. When you book train tickets, always buy the ticket for the entire route, even if you have to change trains. You can even add an overnight stop en route to your destination using a regular (Normalpreis) ticket. When you buy train tickets at a DB counter they cost slightly more than buying them online or from a ticket machine. However, if you are in doubt about your best choice, better ask at a counter and get the right ticket. Advice from the DB staff could save you money. - Which is the best option? I am sorry, I cannot answer this question for you! Before you make a decision you need to know how often, and how far you want to travel by train in Germany. Decide if you want to be flexible, or want to check out savings fares and book a few weeks in advance. Use the search tool on the left to check the ticket price for your route. If a Sparpreis ticket is still available, you'll see both fares. Evaluate how many travel days you would need, and the cost per travel day when you consider to travel with a rail pass, and then check what single train tickets would cost you. Travellers from around the world can buy tickets and search for connections at the Deutsche Bahn website. Just select your country / language on top of the web page. Transportation means include regional trains and S-Bahnen operated by the DB. Underground railways (U-Bahn), trams (Straßenbahn) and busses are operated by private companies and / or local city government. Most cities and towns in Germany are members of a local tariff & transport association (Verkehrsverbund) with different tariff zones. Some associations cover large areas of a German state, not only just a city. The Rhein-Main-Verkehrverbund (RMV), for example, is the second largest in Germany. It covers the entire Rhine-Main-area and much of central Hessen. This is where the confusion for international travellers begins. You can use a rail pass on the DB regional trains and S-Bahnen, but not on U-Bahnen and most buses. Some busses are also operated by the DB, they probably would accept a rail pass well. Tickets (Fahrschein/Fahrkarte) for local transport cannot be bought online in advance. You buy the tickets at ticket machines (Fahrscheinautomat) or at the counter at train stations. S-Bahn & U-Bahn stations only have ticket machines. In a bus you can buy tickets from the bus driver. You need to buy the tickets before you go on a train or tram, otherwise you risk a fine when a controller wants to see your ticket. You often see it written on trains or signs: "Einstieg nur mit gültigem Fahrausweis" which means "enter the train, tram only with a valid ticket". In some cities you have to validate the Fahrschein in a box on the bus, or tram. Just watch what other people are doing. Ticket machines have either a numbered list with towns, or a modern touch screen where you can type in your destination. The machines usually have instructions in English as well. You can buy point-to-point tickets which allow you to change from S-bahn to U-Bahn or bus if needed. However, you can't interrupt your journey for long, you are required to catch the next train. Special offers for regional trains include the Schönes Wochenende ticket (valid one day on a weekend), the Quer-durchs-Land-Ticket (valid one day during the week within Germany) and the Länderticket (valid in one day in one German state). These tickets are a real bargain if you travel in a group or as a family because the second adult and your kids travel for free, or pay a reduced tariff. These special tickets are not valid on ICE / IC trains. If you want to explore a city with multiple trips included, you better purchase a day-ticket. It is less expensive than several single tickets. To find the best options you can play around at the ticket machines. Test the offers, one-way ticket, day-ticket, group-ticket, Länderticket to find the one that gives you the best value. When you are looking for a German rail pass, or any other pass to travel in Germany and Europe, there isn't one service for all international travellers available. It depends on your country of residence which service you can use. I really hope these tips for travelling by train in Germany help you to get around by public transport. I wish you happy travels. Please note: I am not an employee of the Deutsche Bahn. I provide the train travel tips as an information for you, to help you to make the best decision. I cannot guarantee that all info is correct and up-to-date, although I do my best to research correct information. So, I won't accept any responsibility for unknowingly given inaccurate advice. Disclosure: Some links to rail products are affiliate links. This means when you book a train ticket, buy a BahnCard or rail pass through one of these links, I earn a small commission (there is no extra cost for you). This money helps me to maintain this website and provide the free information. You make the final booking on the provider's website. Be sure to read all details before you book. Thank you for supporting this website. Copyright © 2010- Rita Amend.